Throughout the five days we spent in Luang Prabang, we always try to eat local food. Most of the time, we had amazing experience eating cheap, authentic local food. Sometimes, though, we had uninspiring food and vowed we wouldn’t return again to that shop. During our quest to find cheap and delicious food, we relied on bloggers’ recommendations as well as our own guts. 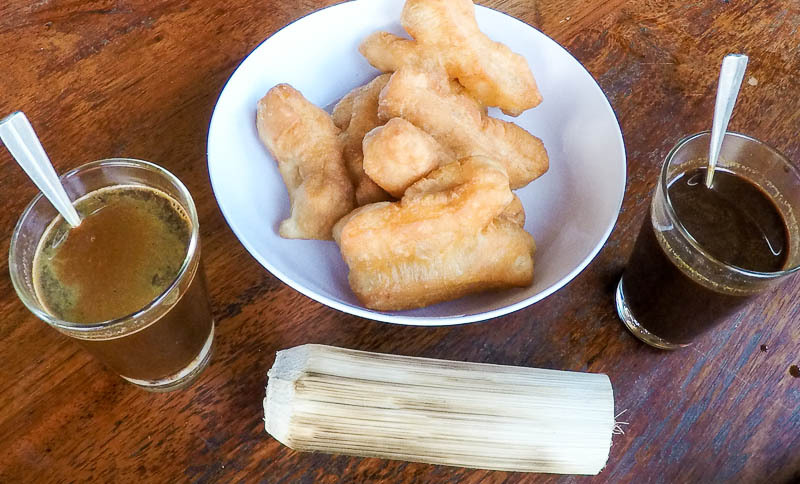 Here are 8 things we love to eat and drink in Luang Prabang, and we wouldn’t hesitate to return to again. Le Bistro Ban Vat Sene (formerly Le Cafe Ban Vat Sene) is one of those cafes that my hubby and I won’t bother visiting at first glance. From outside, it looks so fancy. Given our tight budget, we were sure that we couldn’t afford eating or drinking here. 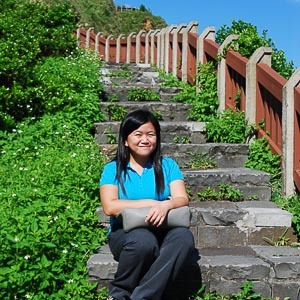 However, this blog post from Explore Laos totally intrigued us. This outdated article stated that a cup of coffee in Le Bistro Ban Vat Sene cost only 9,000 kip. We went for an afternoon coffee break after our lunch. A glass of iced black coffee costs 15,000 now, but it is so worth it. We were the only customers on the second floor, and they turned on the air-conditioner for us. As we browsed through their menu, it caught our attention that Pho is their bestselling item, and it costs only 20,000 kip. That’s unbelievably cheap for a fancy café standard. We knew we had to come back to try it! So, we went back the next day and were blown away by the Pho with pork meat. 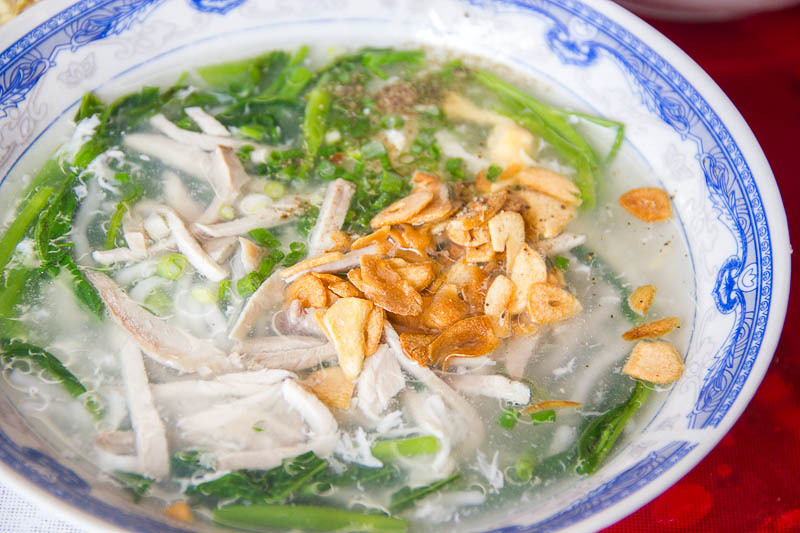 The portion is big, the quantity of sliced lean pork is generous, the soup is so comforting, the noodle is soft. It is just perfect! I ended up ordering a second bowl! Too bad we ate the Pho on our last day in Luang Prabang. Otherwise, we would’ve eaten their Pho every single day! Le Bistro Ban Vat Sene is located at opposite of Luang Prabang Primary, along the main street. 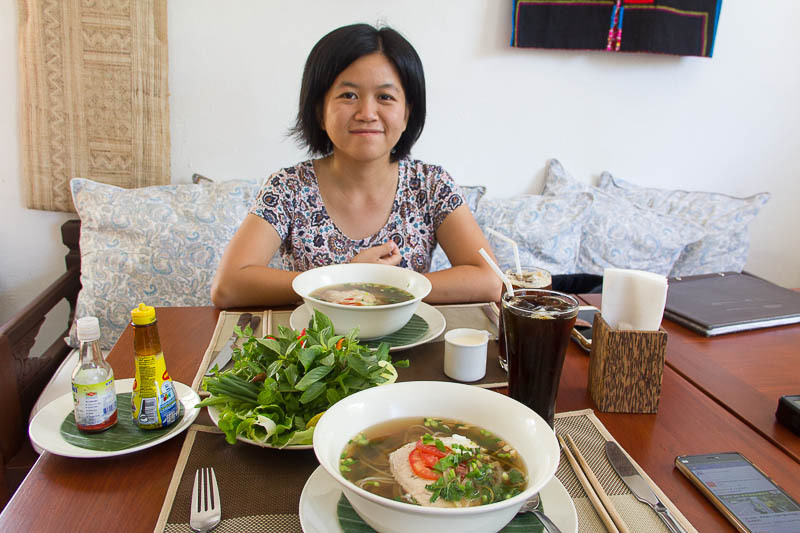 If Cindy Fan, an expert on Luang Prabang, love this Pho with Crispy Pork so much, it’s probably wise to listen to her advice. This Pho is not within walking distance from the town, so when we rented a motorbike to go to Kuang Si Waterfall, we paid a visit to this shop. And, we were hooked! 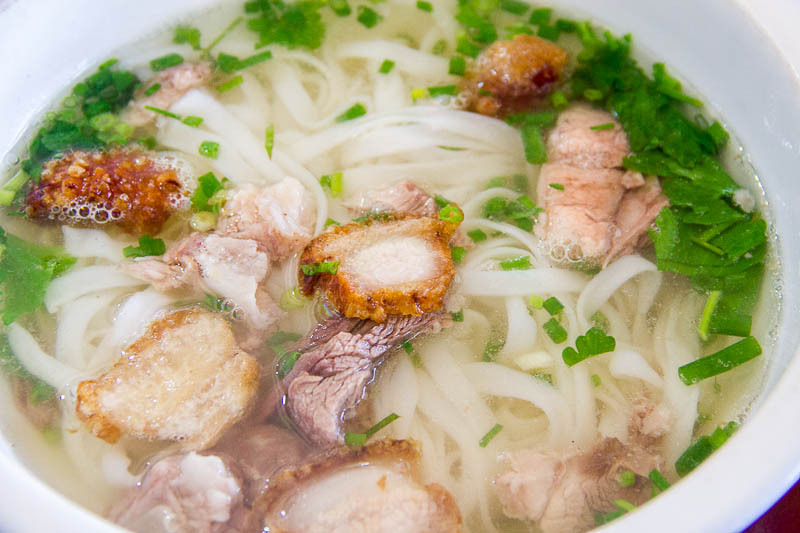 I love everything crispy, but I have never eaten crispy pork with a noodle soup. Apparently, they complement each other well! 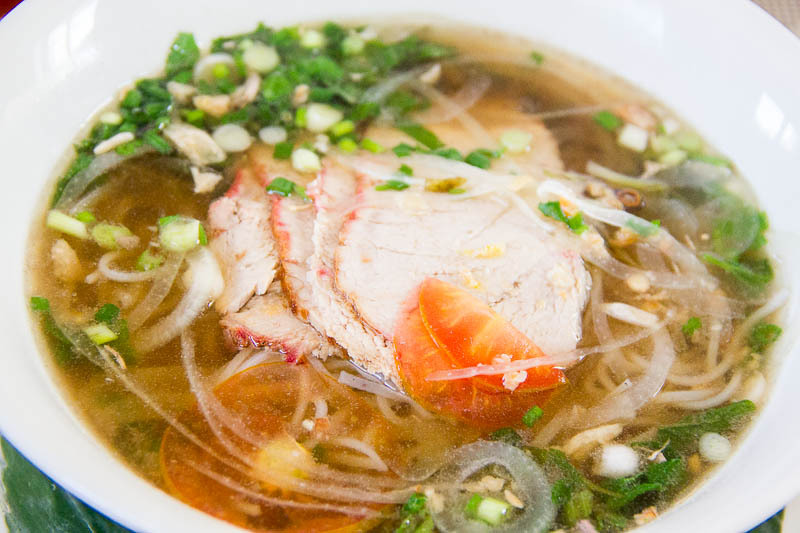 A huge bowl of this pho costs only 20,000 kip. Be careful of the chilli, it’s VERY spicy! The next day, before we returned our rented motorbike, we went back again, cos we loved it so much. The shop is rather hidden, and we didn’t notice the shop when we passed by the first time. It’s located just opposite of Finance Department Building. Here’s its location in Google Maps. 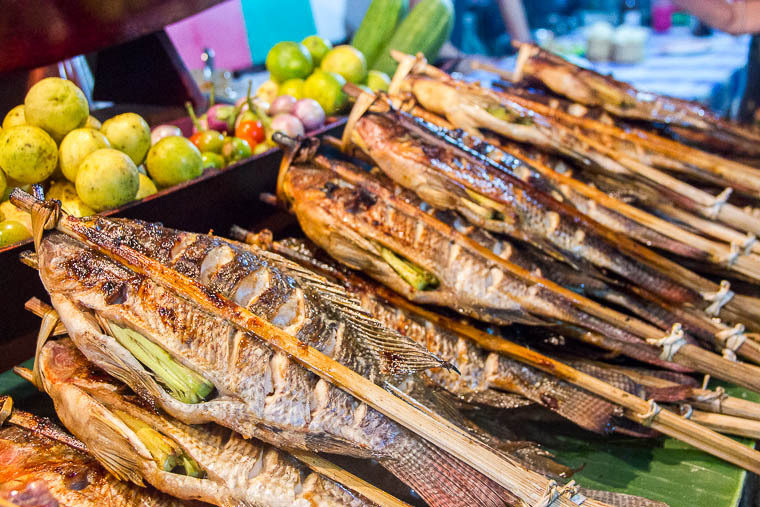 I can’t imagine a better dinner in Luang Prabang than a grilled fish. For 20,000 to 25,000 kip, you can get a whole grilled fish or catfish. The fish is stuffed with lemongrass and grilled on the charcoal fire. Since most of the fish are grilled in advanced, we asked the seller to reheat our fish and he politely did so without complaint. Oh, man, the grilled fish was heavenly! 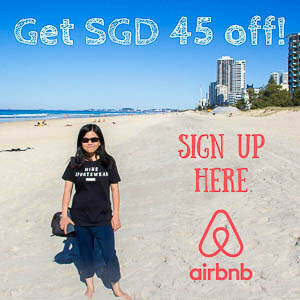 A word of caution: only sit on tables reserved by your seller, not on other seller’s tables. Khao Soi is a noodle soup with minced meat, tomato and fermented soybean paste. It can be found almost everywhere in Luang Prabang. But to find the best Khao Soi in Luang Prabang, we followed Cindy Fan’s advice and visited this unnamed noodle shop at the opposite of Wat Sene. There was already a queue when we arrived. Luckily, we only waited for 5 minutes before a group of customers leave the shop. A bowl of Khao Soi costs 20,000 kip. You need to squeeze and share the table when indulging in this delectable Khao Soi. Sadly, I don’t have a good photo of this khao soi due to the poor lighting inside the shop =( By the way, before you visit, remember this: Go early, they are often sold-out as early as 10am! This shop is located at opposite of Wat Sene, along the main street. 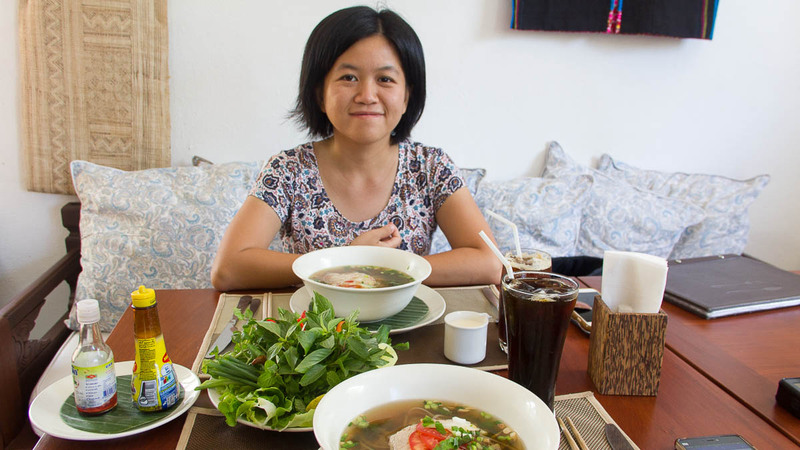 The noodle soup at Xieng Thong Noodle is cheap and different from other noodle soups we have eaten in Luang Prabang. Firstly, the soup is thick and starchy; secondly, the noodle resembles Japanese udon, not the usual thin rice noodle; lastly, there’s a generous amount of fried garlic. 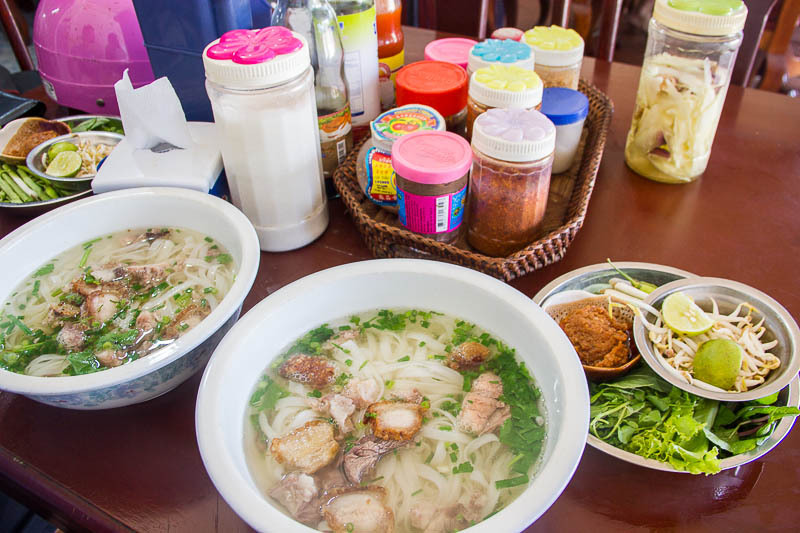 A bowl of noodle soup with pork and egg costs only 14,000 kip. Not everyone will like it, but we sure do. Be very careful of the chilli, it’s very spicy! 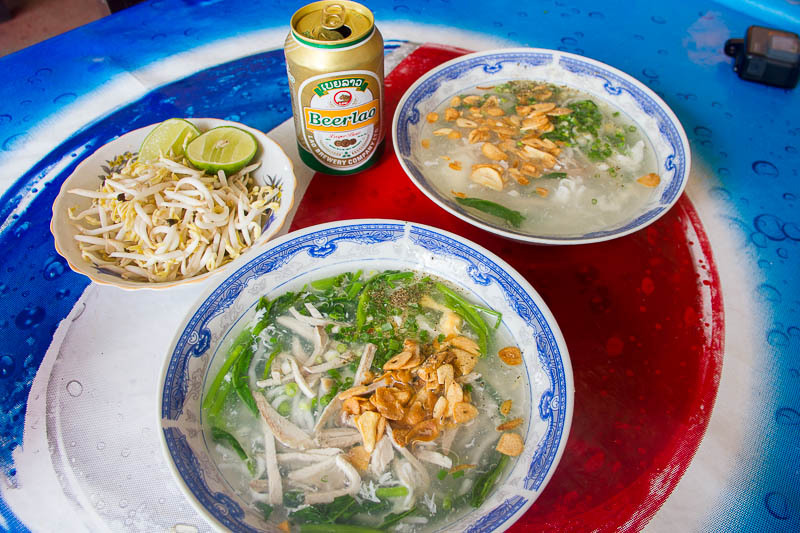 Noodle soup and condiments and beer! After eating noodles for so many days, it’s great to eat something else for breakfast, right? That’s what we thought when we decided to go to Pasaneyom for breakfast. 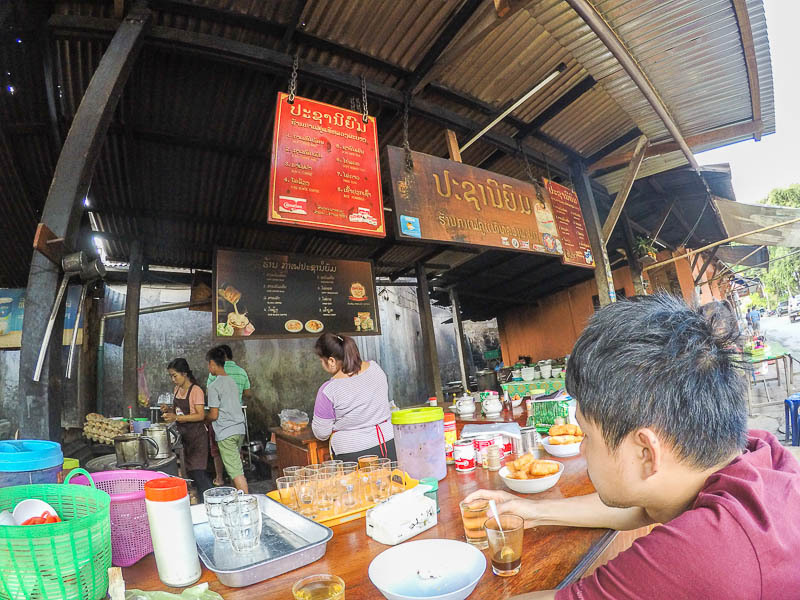 It’s an open-air food stall that sells coffee, tea, fried dough, bread and porridge. Even though the seller doesn’t speak English, her stall is so popular, she hardly stops to catch a breath. Her husband and children were all helping at the stall. Upon ordering two cups of coffee, we were given a small container filled with fried dough, which we gladly ate. After that, we were given 2 cups of warm water! Two coffees and a plate of fried dough cost 15,000 kip. We also bought a sticky rice from a street vendor for 5,000 kip and ate it there. Pasaneyom is certainly a great place to have a light and cheap breakfast. Pasaneyom is located at the junction of Kisalat Road and Khem Khong Road. I’ve said it in my post about Luang Prabang markets, and I’m going to say it again. I love the pomelo from Morning Market. It’s sweet, tasty, small and so juicy. If you love fruits, you gotta try the pomelo! Too bad, I didn’t take a photo of the pomelo because I lost consciousness when I ate it, sorry. Here’s the location of Morning Market. Technically, beer is not food, but I won’t end this post without mentioning our favorite drink. It’s Beerlao! You can find it easily everywhere in Luang Prabang. 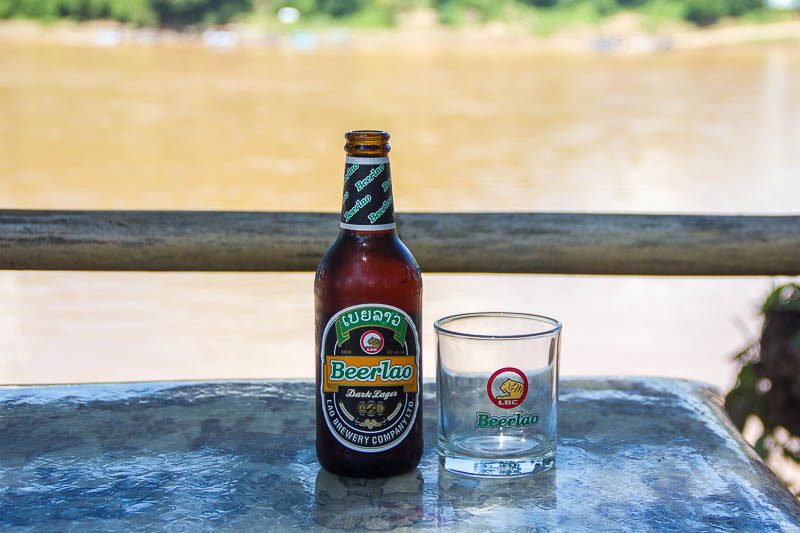 The cheapest place to buy Beerlao is definitely the local convenient shops. We always buy from a shop beside Pasaneyom. A large bottle costs 10,000 kip. Thank you for these excellent tips! Will definitely try them out.